No. There is no drama and no change in impressions from this. Just a little detailed review with the jazz of screenshots. Aatif said, I should do it as it would make an interesting comparison with Google Maps Voice Nav and Nokia Maps Voice Nav. I have not used any of them so this is just the Smartdrive review. Comparison will be upto Aatif. 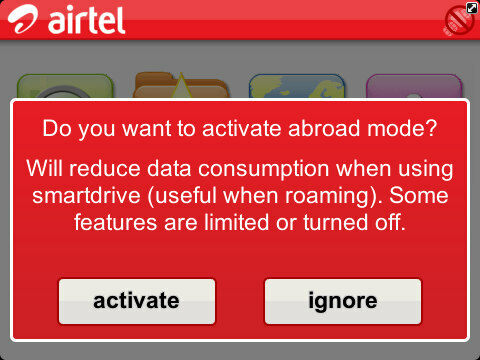 So, I have been using Airtel Smartdrive since Sep 12. Every single tricky ride has been a joy because of that. Since I have a sim from the Airtel’s Maharashtra & Goa circle and using that in Mumbai, I get roaming icon on my phone and since there are no roaming charges, I have not bothered porting number to the Mumbai circle. However, that leads to this app being tricked. Well, that’s how we start. Find/Drive is great. It’s kind of Foursquare‘s Explore. Only with the option to pin the location and drive/walk. The best thing in it has been the population of ATMs! As I said, it looks and works like Explore! The GPS lock has been pretty fast so far. I guess, it’s more of a hardware feature than a map service feature, no? ok. This is where the uniqueness starts hitting. I planned a drive from office to home and the familiar purple line graced my phone’s screen. 🙂 That’s not where it stops. It starts getting the live traffic feed from there on and you can see the Green, Yellow and some Red patches of colour not just on my planned route but all across. Yellow means moderate traffic and Red signifies pretty heavy traffic with avg speeds of 10 – 20 km/hour. No, it’s not my HOOK for the service! Wait. Like this. 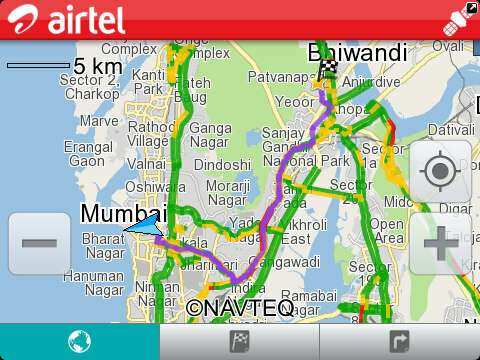 My route shows a heavy traffic patch of about a km on LBS. See the one below. 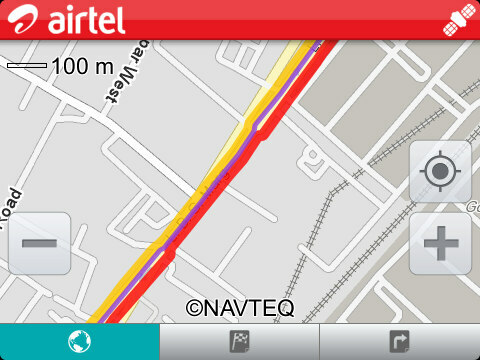 This one shows that my route is having easy flowing moderate traffic while the incoming traffic is well, traff**ked! You know what’s the HOOK? This screenshot below is the hook. it tells me not just in terms of kms, in terms of time and it does that not just once but till the time you are on the fastest track! This is just so awesome. Well, that’s just about it. 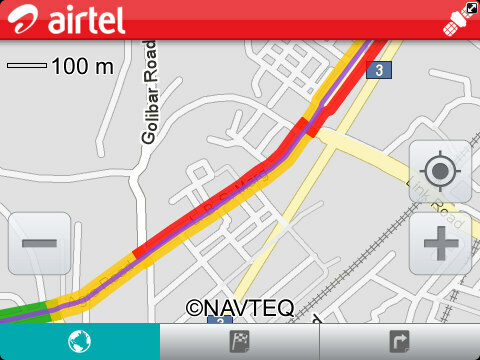 The live traffic feed service is currently available only in Delhi/NCR, Mumbai/Thane/Navi Mumbai and Bangalore. Am sure they would extend it to other cities sooner than later. The language is currently English only and I believe, it will be enough for most of us here. Also, the navigation pack is available for Rs. 99/month or Rs. 10/day and the Live Traffic feed is available for Rs. 49/month or Rs. 3/day. That’s it. Do try it. Looks really feature rich app. 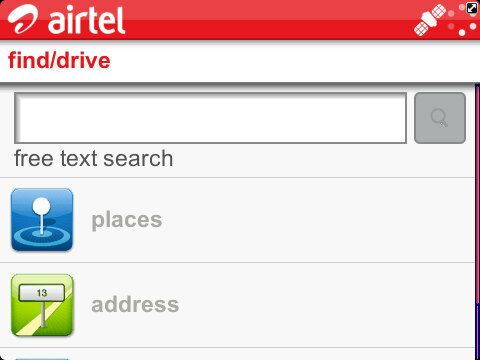 did you try Nokia Maps on mobile browser? It seems to be available for BB7 as well. Honestly speaking, I find most of these things already available on other maps as well and in much polished format. Nokia Maps even including not only offline navigation, but wider coverage and better familiarity due to number of voices available including the possibility of adding your own. It might be ok for non-touch and small screen phones but for rest which are majority now, yet far from mainstream. 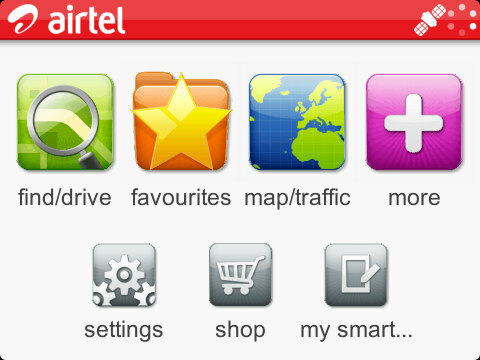 Now, coming to positives and possibilities, if operators like Airtel team up with Google and Nokia to provide Traffic info on basis of available “receivers” (mobiles) on roads, then it would easily denote the condition of traffic rather than relying on the people with their GPS open, then it can extend to service to almost all areas. 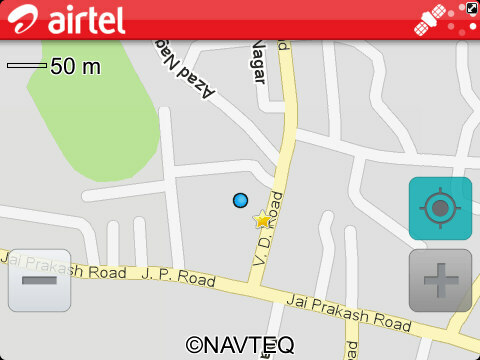 Does Nokia Maps have Traffic info? 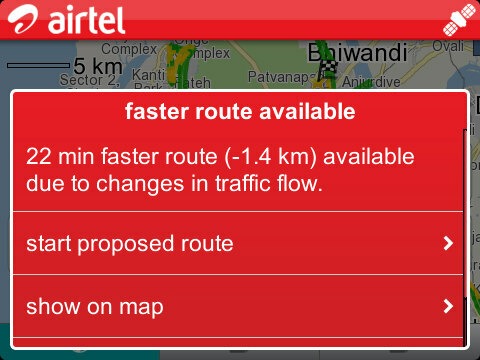 Does it suggest a route change to save time due to less traffic in the middle of your navigation?